With flames of burning police vehicles and the headquarters of President Mubarak's National Democratic Party headquarters lighting up the Cairo night sky, Friday, as protestors defied a curfew, Secretary of State Hillary Clinton spoke briefly in Washington on events in Egypt. She began by urging the Egyptian authorities to restrain the security forces that are cracking down on protestors, but also urged demonstrators to refrain from violence. "These protests show that there are deep grievances in Egyptian society, and violence won't make them go away," she said. New America Foundation analyst Michael Hanna notes that U.S. messaging could have a significant effect on how the Egyptian military reacts to the crisis, while Egypt's Defense Minister is reported as urging Washington not to pressure Mubarak in his handling of the crisis. Clinton reiterated calls for reform and partnership between the government and civil society. "Reform is critical to the well-being of Egypt," she said, adding that "the U.S. believes the Egyptian government needs to engage immediately with the Egyptian people" and respect their right to freedom of speech and assembly, fostering a partnership allowing Egyptians to "participate in the decisions that will shape their lives". There's little sign that the regime is going to open up to real democratic participation, however, and the protestors on the street are beyond demanding reform and a kinder, gentler Mubarak regime. Dr Mohammed ElBaradei, a voice of moderation in the protest movement, told Al Jazeera interviewers that "we are prepared to engage with the regime to ensure a smooth and orderly transition, but there is no question that Mubarak will have to leave." That puts the Obama Administration in a difficult position, because the democratic rebellion in Egypt threatens to sweep away a pillar of support for U.S. regional strategy. Secretary Clinton did not take questions, and a subsequent State Department briefing was canceled. Mubarak to Break His Silence? Four hours after it was announced that President Hosni Mubarak would break his silence and address the nation live on state TV, there has been no sign of what could be the most important speech of his life. Analyst had suspected he'd make conciliatory noises hoping to defuse the anger. But the protestors defying the nationwide curfew imposed by the authorities, burning riot police vehicles and torching the headquarters of Mubarak's National Democratic Party suggests many will see that as too little too late. Mubarak has ordered the military onto the streets to enforce the curfew, but their arrival has been welcomed by protestors. Al Jazeera reports scenes in Alexandria of soldiers shaking hands with protestors defying the curfew. And a crowd surrounding the offices of state TV cheered the arrival of Mubarak's military Presidential Guard. Mubarak's silence now underscores an impression of uncertainty on the regime's part on how to handle the crisis. Tens of thousands of Egyptians streamed out of mosques after Friday prayers and took to the streets to demand the resignation of President Hosni Mubarak after 30 years in power. They clashed with thousands of riot police deployed to crush the protest. Reports from on the ground depict ongoing fierce running battles between police and protestors in Cairo, Alexandria, and other cities. Watch the action in Egypt and elsewhere in the Arab world live, in English, on the network at the center of the storm, Qatar's Al-Jazeera. TIME's Abigail Hauslohner in Cairo confirms CNN's report that the military has come out to augment the police. She saw one tank at the headquarters of Egypt's ruling party. Meanwhile, Hauslohner, speaking over a landline at dusk and just as a curfew was imposed, says that every minute crackling pops of teargas can be heard and seen, fired by riot police and spiraling in lines of white clouds of smoke, the stench (and the fear of being hit by cannisters) keeping people from crossing the bridges over the Nile. At the 6th of October Bridge, demonstrators attacked a moving police truck with molotov cocktails, it then backed up, running over one person and then police opened fired with live ammunition. Earlier in the day, Hauslohner was downtown at the al-Azhar Mosque, the city's largest. It was surrounded by a huge police presence. As the Imam's sermon was wrapping up, a policeman declared, "We have orders to use force." The people nevertheless exited, chanting "Allahu Akbar"  God is great. Mindful of the fact that the challenge to the Arab world's authoritarian regimes is spreading via electronic media and the Internet, the Syrian regime on Friday suspended Internet service, according to Al-Arabiya. But while much has been made of the "Twitter revolution," the Guardian reports that the Egyptian authorities' crackdown on social media sites and SMS cell phone communications has led activists to resort to the old fashioned paper leaflet to spread the message. An anonymous 26-page pamphlet being passed from hand to hand provides an practical guideline to mounting street demonstration. "The leaflet ask recipients to redistribute it by email and photocopy, but not to use social media such as Facebook and Twitter, which are being monitored by the security forces," the Guardian reports. Nobel Peace Prize winner and opposition icon Dr. Mohammed ElBaradei has been placed under house arrest, the Egyptian authorities have announced. ElBaradei, former head of the International Atomic Energy Agency, has emerged as a key opposition figure. 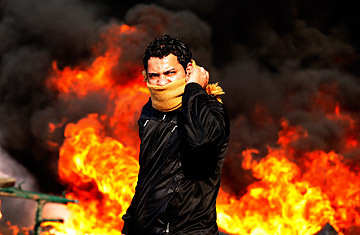 He declared Friday that the Mubarak government was "on its last legs", joining the protest action before his arrest. "There is of course a risk to my safety today, but it's a risk worth taking when you see your country in such a state you have to take risks," he said. "I will be with the people today." Some of the fiercest clashes have come in the industrial city of Suez, where protestors have forced the police into retreat, taking over two police stations. One protestor has reportedly been killed. Al Jazeera earlier showed images of crowds welcoming the arrival of an army personnel carrier on a Cairo street: While the police are the target of the protestors' ire, they have been chanting for the army to "save" them. In Tunisia, it was the army taking the side of the demonstrators against the police that tipped the balance away from President Ben Ali, and Egyptian protestors are hoping to see the same effect. The military remains the cornerstone of the regime, but there are no indications thus far that it will move against the regime.